Laurent and Simone Gbagbo, shortly after their arrest in 2011. Photo: The Guardian. On Friday, reports from Côte d’Ivoire indicated that the government intends to lodge an admissibility challenge to the prosecution of Simone Gbagbo, the wife of former Head of State, Laurent Gbagbo, whose case is currently in the pre-trial phase at the International Criminal Court. The statement comes just a few days after the African Union announced it would hold a summit next month to call for a mass withdrawal of African States from the ICC, to protest against the prosecution of the Kenyan President and Vice-President, Uhuru Kenyatta and William Ruto. Côte d’Ivoire’s co-operation with the ICC regarding Simone’s transfer has not been as smooth when compared to that of her husband. His arrest warrant was issued under seal on 23 November 2011 and he was transferred to the seat of the court on 30 November 2011. It took a mere week to get him to the Hague. Compare that to his wife’s situation. The warrant for Simone was first issued under seal in February 2012 (it was subsequently made public in November 2012), yet 18 months later she remains in the custody of the Ivorian authorities. 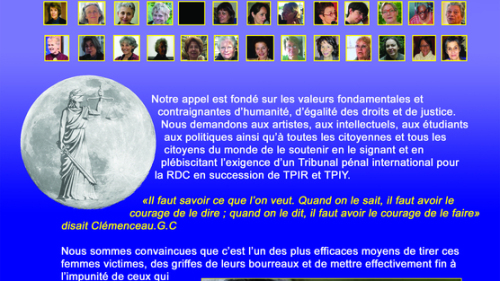 The summer of 2013 witnessed the launch of a petition, initiated by “52 prominent women” including the Congolese lawyer Ms. Hamuly Rély, calling for the creation of an International Criminal Tribunal for the Democratic Republic of the Congo (DRC). The petition, which is still open for signature, was addressed to the French President François Hollande, the American President Barack Obama, the Secretary General of the UN Ban Ki Moon, former UN High Commissioner for Human Rights Mary Robinson, Chaiperson of the African Union Commission Nkosazana Dlamini-Zuma, Secretary General of the Organisation for Francophonie Abdou Diouf, President of the European Union Herman Van Rompuy, and the Presidency of the UN Security Council. Before giving some personal thoughts (III) and addressing the potential judicial consequences of the establishment of such a Tribunal (II), this note focus on the content of the petition (I).